← JULY…Week Three: Raising The Mast! Here it is, already, the last week of July. I’ve spent the entire month blogging about one aspect or another that I dislike about this month: the heat and humidity, those despicable Green Flies and my aversion to sailing. This week, I had planned to end the month of July with a piece about barbecues, but I’m going to spare you a diatribe on the All American cookout. I racked my brain all week and couldn’t come up with a thing. Then, something unexpected happened; a simple act of nature. One morning, after a restless sleep from tossing and turning in damp wrinkled sheets, I felt a cool breeze brush over my skin. I opened my eyes to bright sunlight piercing through the screen – not that grey haze of another humid day. The curtains were billowing in and out with the force of the wind. It was nature’s gift, her reprieve from the oppressive July heat and humidity – a mere shift in the wind from south to north. And that made all the difference. I was instantly energized. I grabbed a scissor and a vase and wandered through the yard clipping hydrangea and roses to add a splash of color in the house. The sky was a bright azure blue with white puffy clouds. The cool Canadian air was pure and crisp and whipped my hair into a wild mess around my face. Even the water in the canal behind our home was flowing briskly, flushing itself clean of its accumulated seaweed. Later, standing at the kitchen sink, rinsing a pint of blueberries and staring mindlessly out the window, I felt myself drawn into the mesmerizing sway of the wind. I absent-mindedly popped a few berries in my mouth and was slapped awake from my trance. My mouth exploded and my eyes opened wide as if I had tasted the sweet sensation of blueberries for the very first time. This is how blueberries should taste, I thought, as I filled my hand with more and more of those tasty little gems. I buy blueberries all year round, but July is their natural season, and the proof is in the tasting. 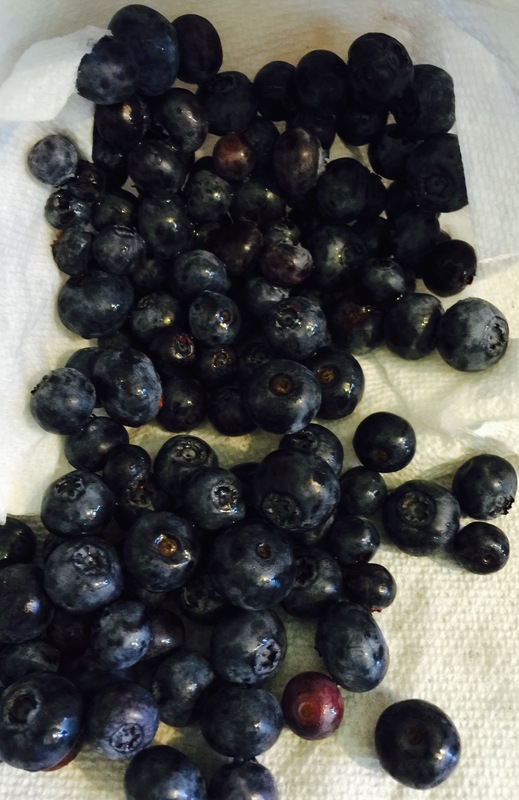 Only in July are blueberries this amazing. Later in the day, I went outside to pick an abundant harvest of fresh basil leaves. July is the month I make my annual supply of pesto sauce. Place first 5 ingredients in a food processor or blender and blend into a paste. Add Parmesan cheese and pulse 2 or 3 times only. Pesto will be slightly lumpy. Do not over pulse. It should not be runny. Boil 1 lb of pasta according to package directions. Drain pasta and add 2 Tablespoons of butter to pasta. Add pesto sauce and toss well. If you freeze the pesto, defrost all day on the counter before tossing with pasta. As I ground up the fresh basil, garlic, Parmesan cheese, pignoli nuts and olive oil, a steady cool breeze came through the window and carried the sweet fragrance throughout the house. It filled my head and evoked fond memories of my father. My mother would quickly open the freezer door, pushing food aside to make room for the jars, packing them snugly around other softer frozen vegetable bags, so the jars wouldn’t bang into each other and crack. Then she would place one in the refrigerator. Though my father passed away in 2011, I still make pesto sauce every year. My family loves it and it makes a perfect side dish for any grilled meat, roasted chicken, or for a meal by itself with some roasted vegetables. 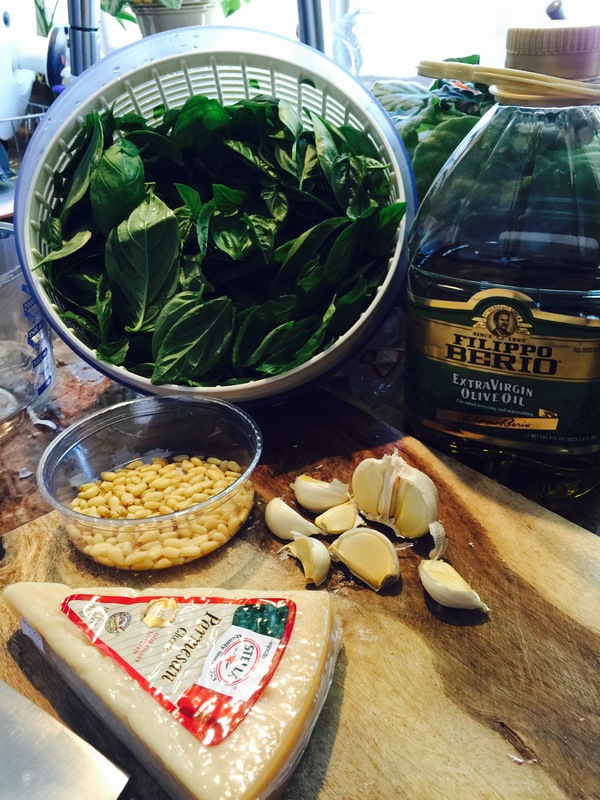 But, besides the taste, I know I make the pesto to remember my father. I can recall his childlike expression of sheer joy at the sight of me pulling those jars filled with bright green pesto out of a paper bag. That face – with eyebrows lifted, eyes opened wide and his mouth in an exaggerated O – it is the most endearing image of him that I have locked away in my heart. The finished product. Ready for freezing. I smiled to myself and thought, I’m having a wonderful day! There are fresh flowers on my kitchen table. 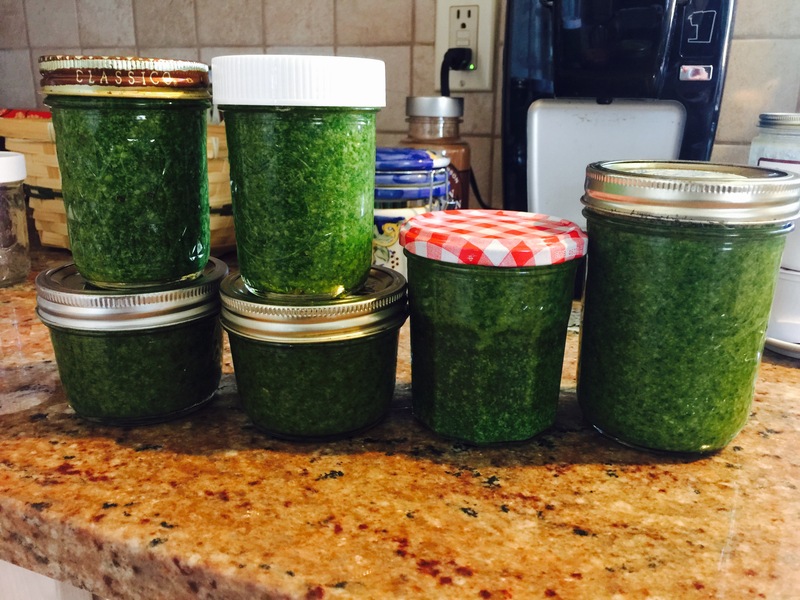 There’s a cool north wind blowing; I had blueberries for breakfast, and I made pesto sauce for my father. This entry was posted in Uncategorized and tagged Blueberries, Humor, July, Memoir, Pesto Sauce, The North Wind. Bookmark the permalink. Another facet of the true you! Thanks for a beautiful feeling it leaves the reader. Really great work this week. I’m choked up! Listen. If you need a place to store some pesto I can make room in my freezer for you. Wonderful- memory and recipe! My mouth is watering!